Convertible Service is open from 8:30 AM to 5:00 PM Pacific Time, Monday through Friday. Our ORDER HOTLINE is available from 5:30 AM to 5:00 PM Pacific Time, Monday through Friday. You can contact us at (800) 333-1140 with any questions regarding your order. For Technical assistance, call our tech help line at (626) 285-2255. Orders placed on our website Monday through Friday at 2:00 PM Pacific time will usually ship within 24 hours. Orders placed Between Friday at 2:00 PM and Sunday will usually ship on the following Monday. You will be notified if there is any delay in processing your order. It is our #1 shipping priority to send out your order as quickly and accurately as possible. If we have need of further information to properly process your order, we will contact you immediately. On international orders, our system cannot compute the freight at the time of order, and freight will be added on later based on the shipping choice made at time of your order. On Convertible Top or Top Boot orders, we will contact you to verify that we are providing the exact material and color that you are expecting. For all orders placed on our website, you will be sent an email confirmation after your order is placed, giving order information and and shipping status. After your order is shipped, we will provide the shipment tracking number so that you can track your order. Information about checking the status of your order will be provided when the order is placed. Further order information may be obtained by calling us from 5:30 AM to 5:00 PM Pacific Time, Monday through Friday at (800) 333-1140. Or email us at sales@convertibleparts.com with questions or comments about your order. 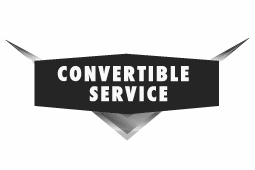 Convertible Service began in 1982 when Paul Terry, the owner-operator, realized that he was better at repairing convertibles than he was at selling them. His home business of restoring convertibles for resale was not going well because of one thing. He was a lousy salesman. So he decided to advertise his expertise at convertible top mechanism repair, at least until a "real job" came along. Well, by the mercy of God, there was a bigger need for this type of work than Paul imagined. God kept sending him more customers and teaching him how to be a good businessman, God, in His grace to all ignorant people, saw to it that none of Paul�s mistakes were terminal. The business has grown steadily (if not rapidly) over the years, moving several times, to more adequate facilities. It has become the goal of Paul and his dedicated associates, Glen, Jan, Bill, Ron, Becky, Tyler, and Larry to be of service to the good convertible owners of America (and the world) and the shops who serve them. They will continue to develop new products, like the ones in this catalog, to solve some of the problems of the convertible owner. Through all of the changes which have taken place at Convertible Service, one thing has remained the same. Paul is still a lousy salesman. But he does know a bit about your convertible top mechanism. You can call on him and he�ll help you. So will Glen, Jan, Bill, Ron, Becky, Tyler, and Larry. That�s what we�re here for. If your convertible works fine, but you have other problems (and don�t we all?) there is someone we can recommend to you without reservation. God. He has met all our needs (business and personal) here at Convertible Service, by giving us a relationship with himself through the death and resurrection of Jesus, His Son. You can call on Him and He�ll help you, too. That�s what He�s here for.